March 23. Pastoral Conference of the Kyivan Eparchy (District) was held in Kyiv. Pastors from different congregations of northern, central and eastern cities of Ukraine have gathered in Kyiv at the ULC Office. 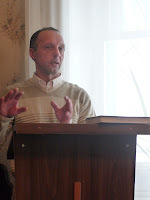 The Conference has begun with devotion of Pastor Vadym Kolesnyk, ULC Missionary to Cherkasy. Pastor of Malyn Lutheran Church has presented an essay Transplantation of Human Body Parts After Death: pros or contras? After discussing the essay, pastors have decided to request ULC Doctrinal Committee to form a special statement on the issue of transplantology which is being discussed quite actively in the Ukranian society. After that pastors have shared news from their parishes and their ministry experience. The Conference was closed late in the evening by prayer of Pastor Vadym Zinchenko, Head of the Kyivan Eparchy. 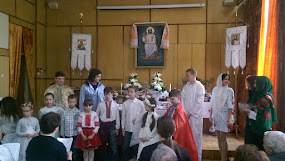 Picture: Pastor Dmytro Didkivski presenting his essay.